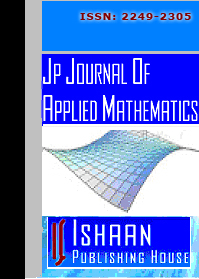 Aims and Scope: The JP Journal of Applied Mathematics (hereafter JPAM) is a peer-reviewed international academic journal having a broader spectrum covering all aspects in the branches of applied mathematics and publishes high quality original significant research papers and critical survey/expository articles. The prestigious interdisciplinary editorial board reflects the diversity of subjects covered in this journal, including Algorithms, Applicable Analysis, Applied Logic, Applied Thermodynamics, Applied Nonlinear Dynamics and Nonlinear Control, Approximation Theory, Bifurcation Theory, Biosciences, Celestial Mechanics, Computer Applications, Difference Equations and their Applications, Discrete applied Mathematics, Dynamical Systems, Finite Element Analysis, Fluid Mechanics, Hydrodynamics, Heat and Mass Transfer, Game Theory, Informatics and Oscillation Theory, Lattice Dynamics, Geophysics, Mathematical Biology, Mathematical Economics, Mathematical Behavior, Mathematical Modelling, Mathematical Physics, Mathematical Psychology, Magnetohydrodynamics, Nonlinear Water Waves, Optimal Control, Splines, Solitons and Fractals in Nonlinear Science and Engineering, System Theory, Ordinary Differential Equations, Partial Differential Equations, Solid Mechanics, Numerical Methods, Plasma Mechanics, Optimization Methods, Soliton Theory, Theoretical Computer Science, Spectral Theory of Differential Operators, Turbulence Theory, Transport Phenomena, Experimental papers. It provides authoritative reviews of current developments in applied mathematics research. Contributions are invited from researchers all over the world. All submitted manuscripts will undergo review process and the publication decision will be adjudged by quality, novelty, suitability and interest. Indexing/Reviewing: Papers appearing in JPAM will be reviewed/indexed in Mathematical Reviews, MathSciNet, and Zentralblatt für Mathematik databases. Frequency: The JPAM is currently published in two volumes annually each having two issues appearing in February, May, August and November.